You've decided to become a fingerprint technician. What is the first step you should take? To help you decide your next step first acquaint yourself with the job requirements for the position of Fingerprint Technician in your local areas. Most fingerprint technicians are employed by law enforcement agencies such as police departments. Check the Employment Opportunities section of your local criminal justice agencies. Most all agencies post their job opening on their website. Be sure to check each agency that serves your area or the area you would like to work with. For example if you are in Hollywood, California you would check the website for State of California, County of Los Angeles and the City of Hollywood. Each of these websites should have an Employment Opportunities section. Most will fall under the category of Law Enforcement or Police. Read through the description to find their requirements for employment eligibility. You may not need anything other than a high school diploma. After reviewing the available jobs for fingerprint technicians you will know what qualifications each agency is requiring. For some it may be a high school diploma, some may require college education and some may require specialized training in the field of fingerprints. Read through each description to know what the hiring qualifications are. Do you need college credits? Can you get hired and learn on the job? If the agency requires specialized training in fingerprint you can usually acquire this through your local community college. Most only require 1 or 2 classes, not a full associate's degree. Contact your local community or city college and inquire if they have classes pertaining to the identification and classification of fingerprints. 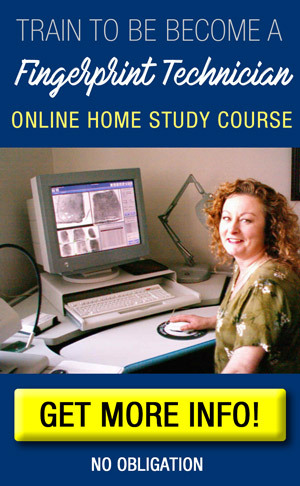 If your local community college does not offer any classes in the field of forensics or fingerprints you can acquire this online. Check out our new online course Fingerprint Identification & Classification, the only course to offer this specialized training completely online. How Do I Get Certified as a Fingerprint Technician? There is no such thing as a "certified" fingerprint technician. You do not need to be certified or hold any credentials to be hired as a fingerprint technician. However you will need essential skills in the area of fingerprint identification, classification and comparison. These skills can be learned through a variety of methods. Many community colleges offer a course in Fingerprint Identification & Classification. If your local community college does not offer such a class you can enroll in an online class. Fingerprint Identification & Classification course offered by FingerprintTechnician.org is the first, and only, online course to teach these skills in a self-paced environment. View more information here. You can acquire certification as a Ten Print Examiner through the International Association of Investigation but you will need to have two years of experience as a Fingerprint Technician to be eligible. It is not something you need for an entry level position. Very few fingerprint technicians go on to acquire certification and they only do so to further their education in the field or to be promoted within their department. The FBI offers Biometric and Criminal History Record Training courses for law enforcement employees only. A course called "Scientific Basics of Fingerprinting" gives a basic overview of fingerprint classification and other topics relating to collection of fingerprints and their identification. These classes are offered in West Virginia but teleconferencing classes are also available. Your employer would send you to these classes to further your education and skills. Most agencies cover the cost of transportation, lodging and other costs associated with attending the classes. Sirchie offers a class titled Introduction to the Science of Fingerprints. This is a multiple day event and the location varies. They hold classes throughout the United States. You will need to attend in person. Below is a list of books you can read to gain a better understanding of fingerprints and how they are classified and identified. A Latent Print Examiner is different than a Fingerprint Technician. Latent Print Examiners study unknown fingerprints collected from crime scenes and determine if they came from a known suspect or unknown suspect. The word "latent" is loosely translated to mean "invisible to the naked eye." Latent fingerprints are left behind when you touch an object with your fingers. You cannot see them and therefore need to be developed and enhanced to be useable. Black powder is dusted over the fingerprint to make it visible. Latent Print Examiners work with these visible fingerprints to determine the identity of the fingerprint owner. Latent Print Examiners typically earn a higher salary than Fingerprint Technician since their duties are much more detailed and specialized. Latent Print Examiners will also testify in court to state their opinion of whether a fingerprint is a match for a known suspect. Most Latent Print Examiners work in a crime lab setting within a law enforcement agency. Although some Examiners work in the field collecting fingerprints this is not common. Check your local law enforcement for job openings and required skills and education. Education required to become eligible for a Latent Print Examiner position is a four year bachelor degree in a physical science such as Chemistry, Biology, Microbiology or Forensics. Some agencies will hire those without a four year degree but you will need job experience working with fingerprints either as a Fingerprint Technician or Latent Print Examiner.